I can't hide I am really excited. 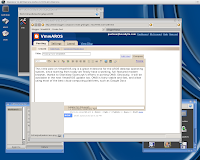 This little post on VmwAROS.org is a great milestone for the AROS desktop operating system and its community, since starting from today we finally have a working, full-featured modern browser, thanks to Stanislaw Szymczyk's efforts in porting OWB. Obviously, it will be available in the next VmwAROS update too. 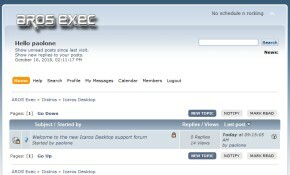 OWB is fairly stable and fast, and allows using most of the best cloud-computing platforms, such as Google Docs and, why not, the blogger.com platform I use for this site. From now on, AROS will allow an almost full web experience to its users, getting many and many times more usable and reliable than before. So I can't tell nothing more than "Thanks Stanislaw", you've made a dream come true. PS: this update will upgrade our custom muimaster.library to the standard one. This will prevent some older applications to run. In order to fix this, just use the SwitchMuiMaster commodity. More about this in the PDF manual.